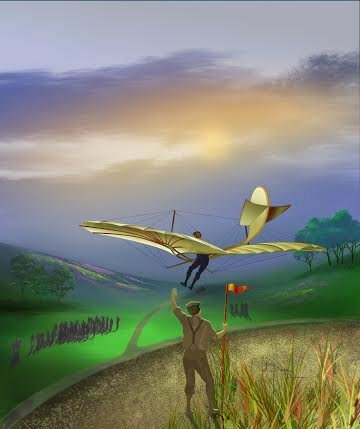 Lilienthal glider- Otto Lilienthal study and experiments in the development of heavier-than-air flight, he made his flights from an artificial hill he built near Berlin. In 1891, Lilienthal succeeded with jumps and flights covering a distance of about 25 meters (82 ft). In 1893, in the Rhinow Hills, he was able to achieve flight distances as long as 250 meters (820 ft). Between 1891 and 1896, he completed some 2,000 flights in at least 16 distinct glider types. His career as a builder and pilot of gliders coincided with the development of high-speed and stroboscopic photography. Images of Lilienthal flying through the air aboard his glider appeared around the world in newspapers and the magazines of the period. Those pictures convinced millions of readers in Europe and the United States that the age of flight was at hand. Lilienthal’s crashed when a gust of wind stalled his glider on Aug. 9, 1896, he died in a Berlin hospital the next day.